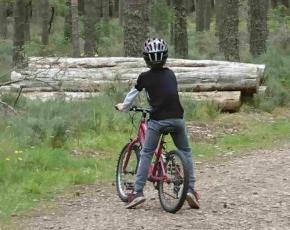 It’s the Easter holidays and often the best fun is discovering the countryside on foot or by bike. A family cycle ride gives lasting memories. We’ve asked around and here are some top tips on places to cycle with the kids this holiday. Some trails are just too bumpy for beginners so an easy cycle path is what you’re after. Lydiard Park in Swindon gives plenty of space to practice with the added bonus of an ice cream at the end. If ice cream is a good incentive there’s another easy trail from Devizes along the canal to the café at Caen Hill locks. Cycling around Coate Water Park in Swindon is also easy fun. Cycling along the Kennet & Avon Canal is easy, peaceful and beautiful. Start at All Cannings bridge car park and cycle towards Pewsey. Salisbury plain has lots of trails as does Savernake Forest and can provide endless fun for all the family. There are lots of off road quieter paths in the Cotswold Water Park, and being flat it’s a breeze. National cycle route 24 and 25 go through the Longleat Estate so pick it up there for a family bike ride. Brinkworth, near Malmesbury has a market with coffee shop every Wednesday morning so a reward awaits after a cycle on one of the many surrounding rural paths. The Ridgeway is great for cycling with sweeping views but can be bumpy in parts. Pick up the trail at Hackpen hill and cycle towards Avebury or from Bishopstone to the Uffington White Horse. The Marlborough Downs byway to Barbury Castle is also great fun. 3. Keen to stretch your legs a little more? There’s a great cycle trail from Salisbury Cathedral to Stonehenge. Mostly off road along the river and bridleways it skirts around Old Sarum castle remains with the grand finale being the approach to Stonehenge as you cycle up the hill. The North Wiltshire Rivers route is part of National Cycle Route 4 and links Melksham, Lacock, Chippenham, Calne, Cherhill and Avebury. The route is mostly traffic free part of which goes along the River Avon and Wilts & Berks canal as well as taking in lots of sites of historic interest. Mountain biking on the Stourhead Estate – an annual permit will let you cycle at any time of the year. Tidworth free ride bike park has lots of jump and stunts. It’s got 6 downhill tracks a progressive jump area and BMX dirt trails. Head to the Cotswold Water Park where you can hire bikes for all the family. Pick up a bike in Bradford on Avon and head along the Kennet and Avon Canal towards Bath or Devizes. Got some more suggestions? Please email us on hello@localuncovered.com and we'll add them to the blog. Happy Cycling!